The Southern California borderland is a tectonically fragmented environment that facilitates subsurface fluid movement in dynamic and unpredictable ways. In October 2018, we sailed aboard the Schmidt Ocean Institute's R/V Falkor to investigate seepage environments in the region and test new autonomous instrumentation to measure in situ geochemical profiles. We re-visited Point Dume, a series of carbonate chimneys that host methane-oxidizing microbial communities, as well as Rosebud the whale fall, which had progressed to a new stage of its decomposition on the seafloor. Several other small seeps were discovered in unexpected sites, including a basalt-hosted chemosynthetic system just south of Catalina Island. Marum Crater - a series of active volcanic vents and lava lakes on Vanuatu's Ambrym Island - is one of the most remarkable geological features on the planet. It accounts for 5-9% of global volcanic emissions of water vapor, carbon dioxide, and hydrochloric acid, 10-17% of sulfur dioxide and hydrofluoric acid, and more than 30% of silver, selenium, and tin. Given this unique and exotic brew of chemicals, aqueous environments harbor enormous potential for previously unseen microbial diversity. Through an initial reconnaissance of Marum's ephemeral pools, we are investigating the controls on habitability and diversity while pursuing activity-based assessments of novel metabolic pathways. Traditionally, methane seeps and their associated ecosystems have been associated with convergent plate boundaries (e.g., the west coast of the Americas) or well established hydrocarbon repositories (e.g., the Gulf of Mexico). The recent discovery of actively seeping systems along the continental shelf-slope break off the coast of New England was a surprise, and is likely attributable to dissociating methane hydrates. During Atlantis Cruise AT-36 in August, 2016, several early career scientists were selected to learn more about conducting deep sea research in an immersive, multidisciplinary environment. In addition to a full scientific program using the Alvin submersible and the Sentry AUV, we incorporated telepresence into scientific operations to evaluate how remote technologies could be used to enhance research-oriented expeditions. My reports from this expedition were published on National Geographic's Explorers Journal. Click on the cover images below for full stories. Southern California is a sprawling megalopolis with tens of millions of people, and yet, just kilometers off the coast and hundreds of meters beneath the sea surface, unseen habitats await discovery. In June 2016, the Exploration Vessel Nautilus set its sights on the region, deploying the ROVs Hercules and Argus to conduct visual surveys and collect high-priority water, animal, sediment, and rock samples. At the Santa Barbara Basin, sediment samples were collected in oxygen minimum zones to use foraminifera data in support of paleoclimate reconstruction. A vertical transect of the San Juan Seamount cataloged remarkable coral and sponge biodiversity. Putative hydrocarbon seeps at Point Dume supported microbial mats extending hundreds of meters along the seafloor; previously uncharacterized reef-like carbonate constructions were also observed, raising new questions about fluid flow dynamics and persistence, and its impact on carbon and sulfur cycling at seep sites. Click on the cover images below for my reports from this expedition. Lava lakes are remarkable geologic features where continuous low-level eruption is delicately balanced against dissipative and cooling forces. Less than ten active lava lakes are currently known, and the volatile-rich feature at the bottom of Marum Crater on Ambrym Island, Vanuatu, is the most active of them all. As a part of an exploratory expedition led by Sam Cossman, we conducted the first geobiological sampling effort inside Marum Crater. By collecting basaltic materials across a range of ages - from recently-cooled, seconds-old rocks to 1960s flows - we hope to determine the timescales on which microbes colonize terrestrial substrates, and how community structure changes over time. Such colonization has occurred in all extruded volcanic output over billions of years: "time-zero" and other young samples represent a promising opportunity to evaluate this process. In May of 2014, this cruise about the Monterey Bay Aquarium Research Institute's Western Flyer visited a range of deep-sea heterotrophic and chemosynthetic habitats. At a series of whale falls, microbial and macrofaunal succession patterns were studied. At Fossil Hill, ancient worm tubes and clam shells were cemented by authigenic carbonate, and the possibility of continued methane seepage was investigated. We also deployed a novel tube core that maintained an intact core and enabled sampling or amendment at various depth horizons. 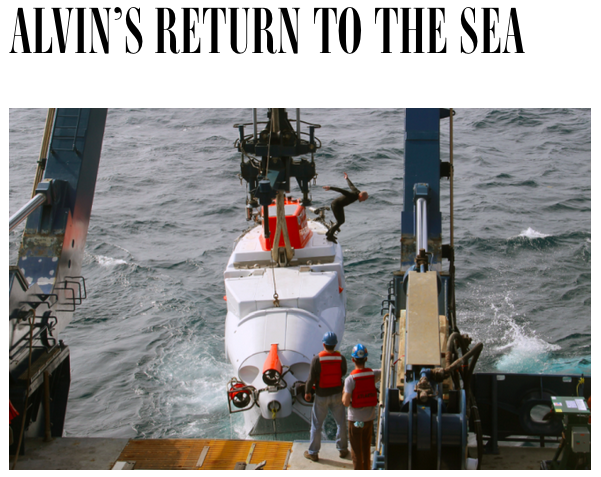 After a two year hiatus that saw the Alvin submersible undergo its most thorough refurbishment in its 50-year history, the country's most prolific deep-sea exploration vehicle returned to operations in March, 2014. During this Science Verification Cruise at various deepwater sites in the Gulf of Mexico, we tested Alvin's functional capabilities (including sub-instrument interfaces, navigation, sampling mechanics, and digital data collection) while conducting opportunistic science. Notable scientific results included seafloor surface-exposed methane hydrates, in situ pH measurements, and oil-infused carbonate rocks that represent the second demonstrated example of endolithic methanotrophy. Click on the cover images below to read my WIRED-published reports from this expedition. For more on the Alvin re-building project, see The Window's series of short documentaries. In 2010 and 2011, two research cruises to the Hydrate Ridge methane seep complex in the eastern Pacific examined the geochemical and geobiological links between subsurface carbonate mounds and seafloor sediments, as well as the fates of "inactive", seep-adjacent sites. The multi-disciplinary team was led by Principal Investigators Lisa Levin, Victoria Orphan, and Anthony Rathburn, and resulting publications have transformed the way we conceptualize microbe-animal associations, microbial colonization patterns, viable methanotrophic communities, and habitable substrates at methane seeps. As a member of the science party during these expeditions, I filed reports on the proceedings for The New York Times. Click on the headlines below for more. The ancient methane seep deposits in the Middle Atlas mountains near Khenifra, Morocco, represent an exemplary fossil carbonate mound to test the analytical treatment of biologically mobilized methane. Samples were collected for analysis in Mars mission life detection prototype instruments, and to determine how isotopically light carbon is maintained in specific biomolecules after millions of years. This unique expedition brought scientists, industry leaders, economists, and political strategists together to examine the effects of climate change on environmental dynamics on the Antarctic Peninsula. A range of policy proposals were developed, some of which were subsequently presented at UN Climate Change Conferences. I filed reports on the experience for The New York Times; click on the headlines below for more.